Once again one of our finest apprentices Geoffary Mullins showcased his talents in the Arizona Building Alliance’s SkillsUSA Arizona Craft Championships! The fun took place amongst the top 9 scoring participants on a written entrance exam plus a room full of observers. 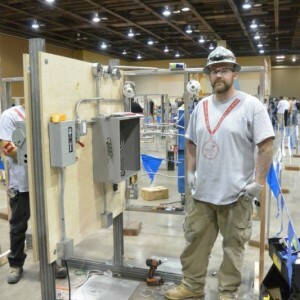 The 7-hour long skills test encompasses a written test to identify your mastery level of the National Electric Code (NEC) plus conduit bending exercises and a hands-on installation of a number systems. The athletes must work using drawings and specification sheets to produce a project that is judged on general workmanship, accuracy of layout and installation, and adherence to the current NEC and standard industry safe practices. Jenco is a learning organization with a culture of knowledge seekers and a proven track record of helping develop employees’ careers. Jenco is a big supporter for our apprentices with our leadership cheering on events like the Craft Championships and our owners investing in tuitions. Geoffray Mullins has been a wonderful contributor with Jenco since 2010 and is rockin’ his ABA program. Congratulations Geoffray on a challenge well done! ← Running out of Steam?